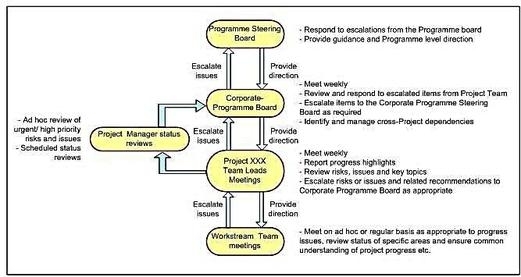 This section details how Risks and Issues are escalated as well as Reporting progress upwards.You could create something along the following which lets be honest is a bit OTT or simply copy one done in another PID approved within your Organisation. After all why reinvent the wheel when there are far more important things within the PID you should spend your time on getting write! In theory this section is required so that it is clear what the reporting lines are within a Project Team. However in reality I think this section is here for Business Stakeholders to be reassured that not only are all the various workstreams involved but also that named resources have been assigned to work on the project. 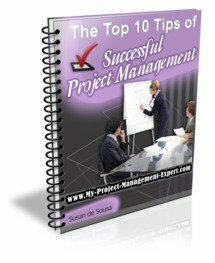 Often in companies which have a large pipeline of projects to deliver getting and keeping resources on your project is a major problem. To complete this section you will unfortunately need to complete an Organisation Chart for this section. This is usually easiest done in Visio, so if you don't know how to use it you should learn fast! Luckily it's fairly straightforward to use as long as you don't try to do anything too complicated. The project will be implemented by a cross-functional team with experienced representatives from multiple departments including Development, Interactive, Test, Networking, Infrastructure and Business Systems, Security and Marketing. The involvement of the different areas will vary as the project progresses, with some areas having lighter involvement in the earlier phases and being more closely involved in the run up to launch (e.g. Operations and Support who will have leads appointed nearer launch). Please note that the reporting lines reflect reporting lines for the project only and not standard business reporting lines. Make sure you get the reporting lines and names / titles of individuals correct before the PID goes out for Informal Review. Especially those who are more senior than yourself. You would be amazed how many PIDs end up going through an additional round of Informal Reviews simply because these were incorrect.